We’ve been having a lot of hot weather the past 2 weeks (hit 102ºF on June 21st), which has made hive inspections problematic. 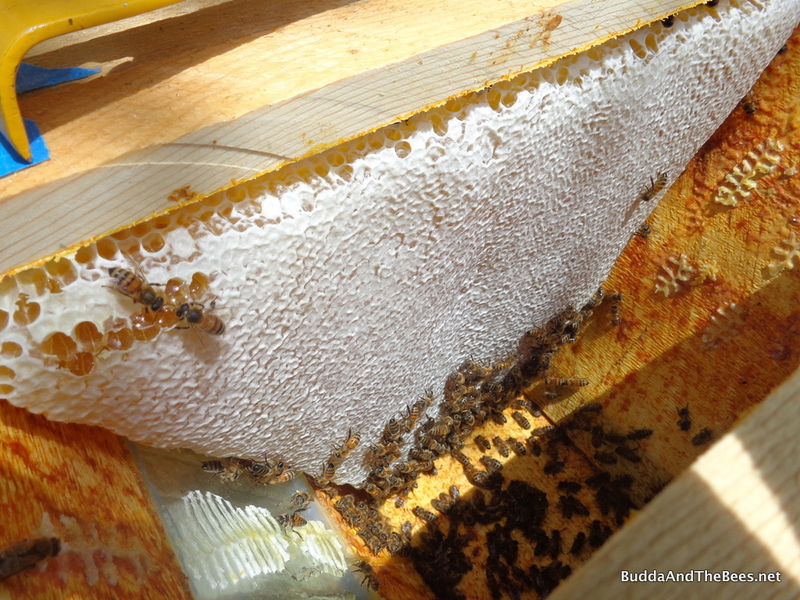 When it’s really warm, new comb can easily collapse, especially if it’s loaded with nectar or honey. 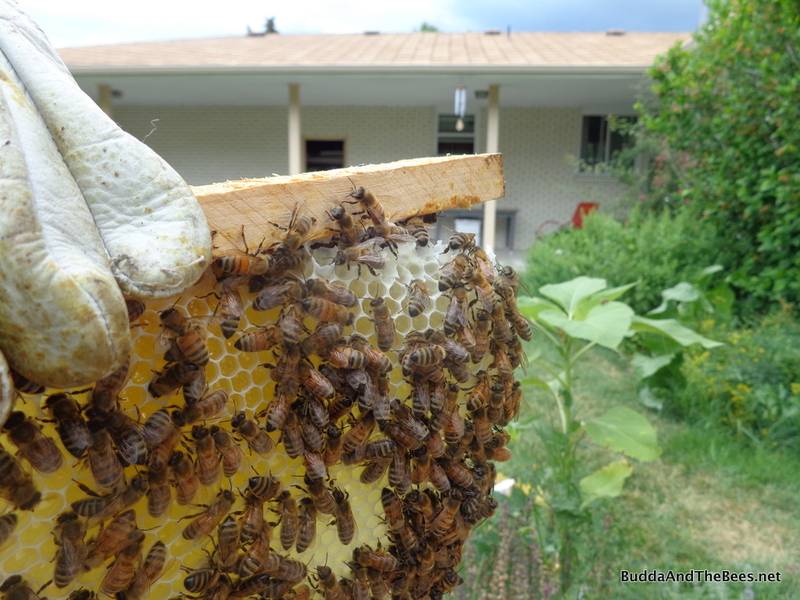 A collapsed comb full of nectar is a sticky mess to clean up – no fun for me, or the bees! I had one collapse on me in the Hello Kitty hive on one hot day recently which has made me avoid looking into the others. Today started off cool and since I was way behind on inspections, I decided to do full inspections on all the hives to see how they are faring. The comb that collapsed was cross combed with another bar so when I pulled them apart, down she went. I should know better than this – especially on a hot day. I wanted to check how well they had cleaned up the mess and since it’s almost full, I wanted to check all the frames to make sure they weren’t preparing for a late season swarm. This hive is rocking – lots of bees, brood and honey – probably the best of the bunch. Duncan’s away, so I didn’t have my helper with me today. First, I had to remove the follower board, which was all the way at the back, since they are running out of room. They were still cross combing, so I did a bit of surgery and rearranging to help them build straighter, single combs. 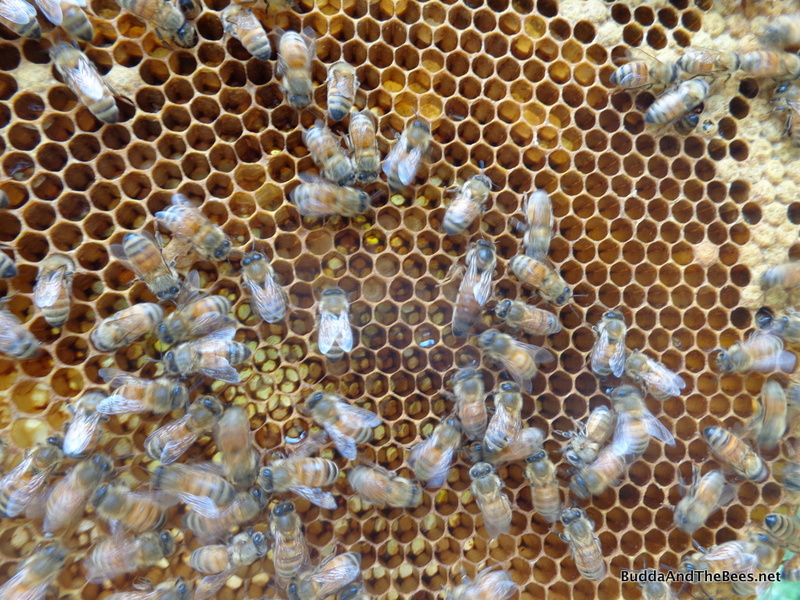 They are making honey and new comb very fast right now – the flow is on! Lots of things are in bloom – particularly catmint, Linden trees, and lavender. While I was doing the inspection, one of the neighbor’s sons who was visiting, saw what I was doing and came over and asked if he could watch. (He was probably in his late 20’s/early 30’s judging from the dreadlocks). I told him that the bees were pretty agitated, but he was welcome to watch. He stood about 10 feet away, but a couple of guard bees started going after him and he got stung on the head and he ran back to his house. After I finished closing up the hive, I checked to make sure he was wasn’t having an allergic reaction (that’s all I’d need). He said he was fine, and then we had a nice chat about what beekeeping was like – it’s a great conversation starter! Every time I open this hive, I just love to see the pretty little golden Italian bees. It’s such a treat! 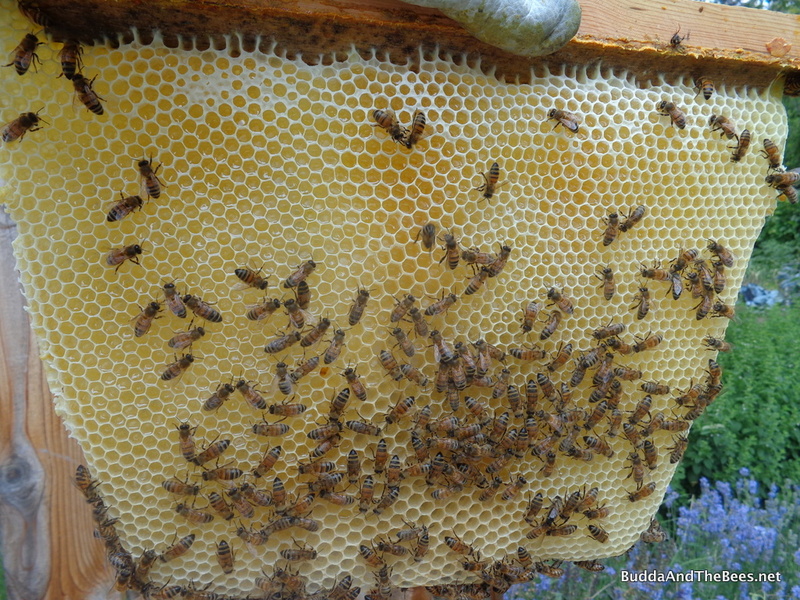 They are not making much new comb, but are starting to fill the drone comb I put in the back with nectar. They’ll need to build up some honey stores soon so they can get through the winter – if not, I may have to take some from one of the other hives. 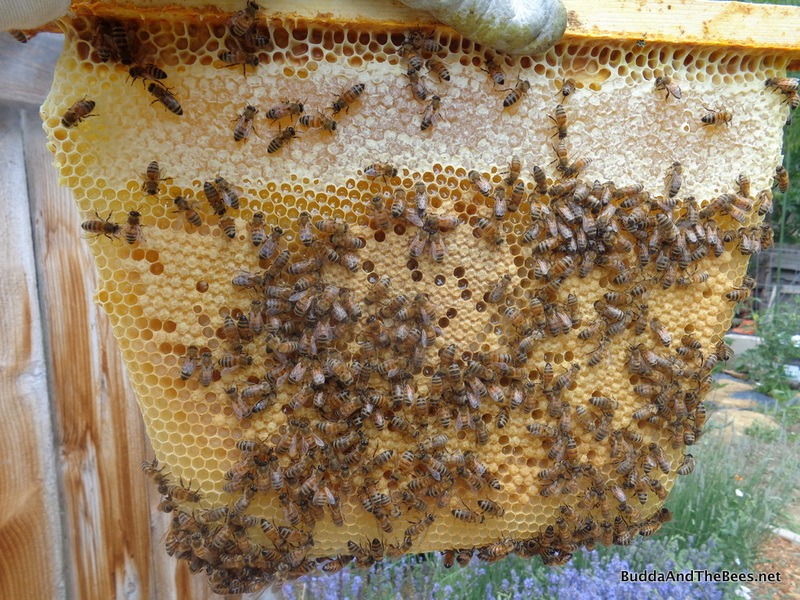 But, in general, this hive is doing well – lots of brood, pollen and bees. This is the only queen I saw in any of the hives today. A couple of weeks ago, I looked into the Left Hand Hive (my only Langstroth) and was ready to put on a honey super (a shorter box that would be used for honey, not brood) so they could expand with the honey flow. But when I looked in, the bottom box was empty and all the brood was now in the upper box. At that time, I added a foundationless frame to see what they would do with that. This time, both boxes were full of brood and they had fully drawn out comb on the empty frame – nice and straight, mostly drone comb. I could see some varroa mites in the bottoms of the cells, so I’ll have to watch this hive carefully. At this time of the year, the queen slows down on her egg production (after the Summer Solstice) and mite loads usually increase. There were virtually no mites on the bottom board, which was curious – I would expect to see some since I can see them in the cells. Top box waiting for inspection – new comb between frames. Since both boxes were full, I put on the honey super. It may be too late for the current flow, but it will be interesting to see what they can do with it. They already have some nice honey in the bottom two boxes around the brood. I’m pleased with how well this hive has built up. I also added another foundationless frame in the bottom box. I still haven’t found the queen in this hive, but there’s plenty of brood so I know she’s in there! It’s been over three weeks since I have been able to look at Sarah’s hive. 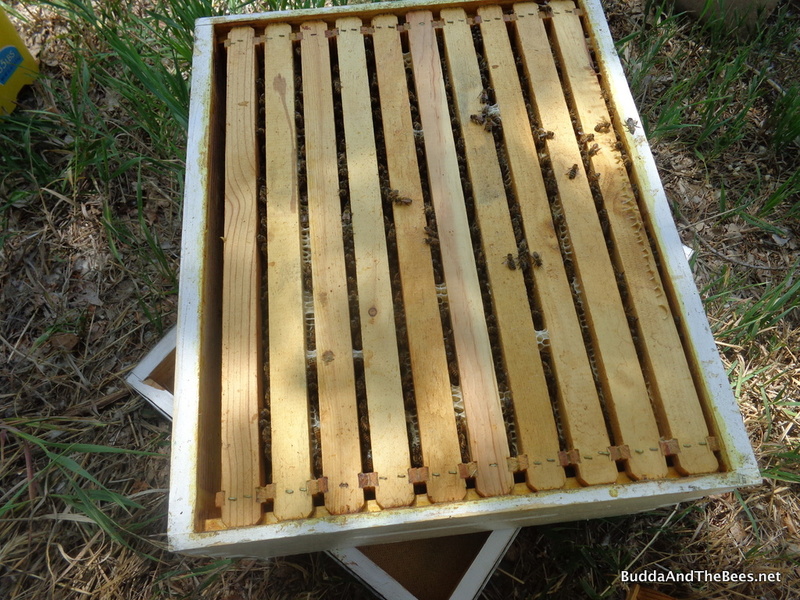 With a Top Bar Hive (TBH), you really need to look in once a week or so when they are building new comb to make sure that they are not cross combing and are building straight combs. Well, they took advantage of my absence and went to town hooking combs together. But they are also capping honey faster than any of the other hives. So, I left some of the combs hooked together and since they have capped honey, I plan to harvest those later in the summer. I rearranged some of the combs – putting the new small combs between fully formed ones so they’ll grow straight. I’ll check back in a week or so, to make sure they doing what they should. This hive had me worried because it had a gaggle of drones that were eating up all the nectar. Since the drones are gone, they have now started storing nectar which will soon turn into capped honey. They are filling up the old drone cells, so when I harvest the honey, I’ll get rid of a lot of the drone comb. 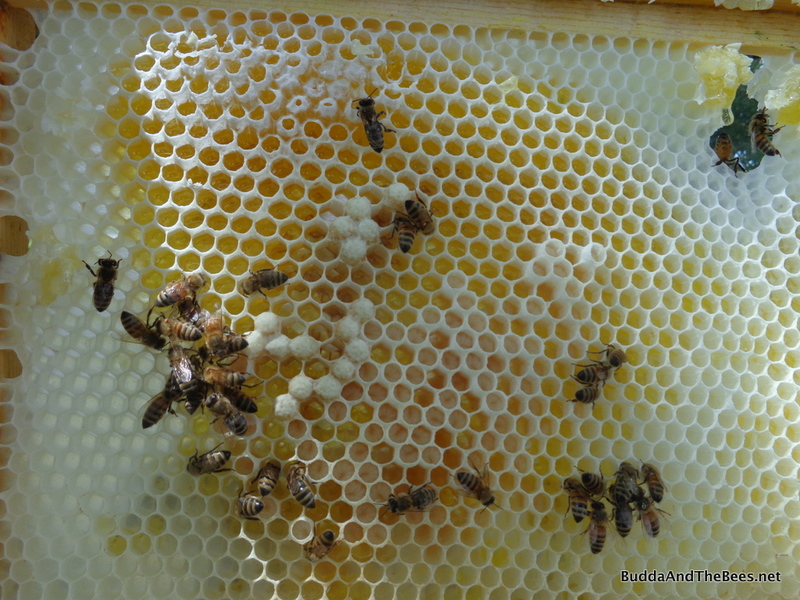 The queen seems to be doing well – there is plenty of brood in this hive. There were very few mites on the bottom board – hopefully the brood break during the split/queen rearing put a big dent in the mite population. I wore gloves today because some of the hives were pretty agitated. I’m afraid that if I get stung and my hand swells up, I’ll have problems with my wedding ring. (I forgot to take off before hanging out with all these girls). But, I should have put rubber bands on my pant legs because one crawled up and stung me on the ankle. Live and learn! As I started inspecting BnB2 and BnB1, a thunderstorm was rolling in. 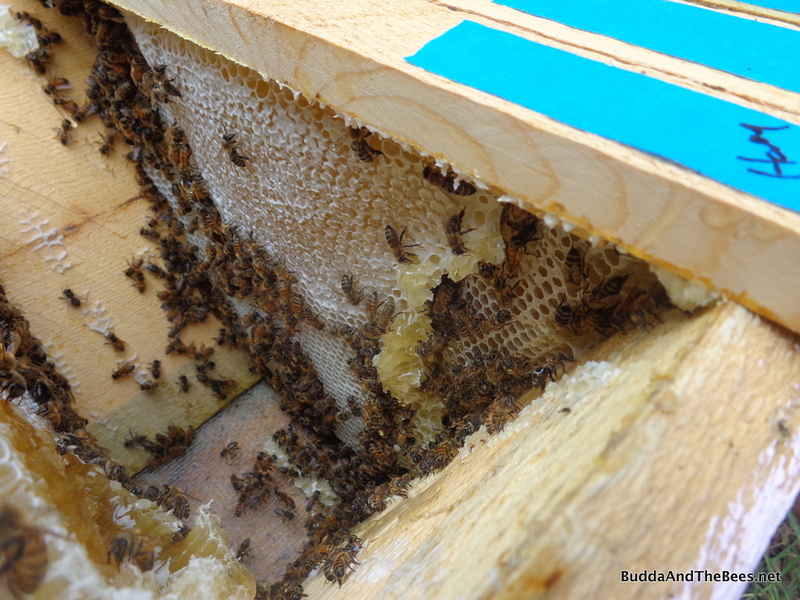 Since rain was imminent when looking in BnB1, I decided just to look at the back where they were building comb and storing honey. Once again, they were starting to build off the comb guides and I had to do some fixes on the last few combs. This hive is also capping honey nicely, so I might get to harvest some unless I need it for Laura’s hive. Even though I didn’t get through the whole hive, I think this hive is in good shape. It also had very few mites on the bottom board. I had to hurry and close up BnB1 because the thunder was getting closer and louder, so I didn’t look in BnB3. Maybe I can get in on Fourth of July since tomorrow is supposed to be hot again and I wouldn’t be able to look in until the afternoon. But, I recently made a new stand for BnB3 (and another nucleus hive to be built/named later). 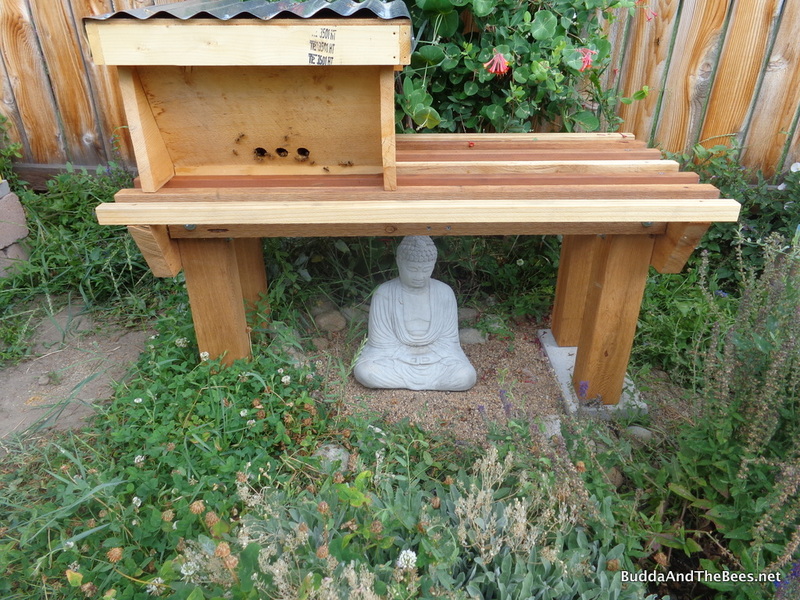 Buddha now has a nice little arbor over his head to keep off the hot sun. Having seven hives now it takes a lot more time to do inspections, but it got me out of weeding the garden (at least for today). Happy 4th of July! Buddha is looking cool & those capped combs of honey are sooooooo pretty! I have to ask — what’s your secret? Do you even have one? My bees just don’t seem to cap spring honey in my hives. They fill the combs up, but nothing ever gets capped. I can’t even switch bars around, because nobody has space. Does the heat in your area help dehydrate honey? Your poor neighbor! Hopefully, he hasn’t been put off bees entirely. What a way to break him in! LOL! The guy was just visiting his mom for the weekend – he was from Salt Lake. He was really cool about it – at least he now knows what some of the hazards are! I wonder if extra ventilation aids in the capping of the honey. In my Langstroth hives, when the honey flow is kicking into high gear and I see the bees fanning the entrances of the hives, I remove the inner cover and replace it with an empty moisture quilt, essentially a big rim with screened holes in the side and a screen on the bottom to keep the bees from building comb above the top bars. Most of the humidity inside the hive disappears after that and I think, I’m pretty sure, the honey gets cured and then capped faster. That’s what I’ve doing with my Langs for the past fews years, anyway, and the extra ventilation (when it’s scorching hot) doesn’t seem to hurt. Looking at the honey in your TBHs, I’m pretty sure I’m building a TBH or two for next year. It’s time. I’ll have to keep that in mind for my one Langstroth if I actually get honey in the super this year. I’m sure the bees appreciate the extra ventillation in any case. I still have a lot to learn about Langs – I appreciate the posts on your blog. 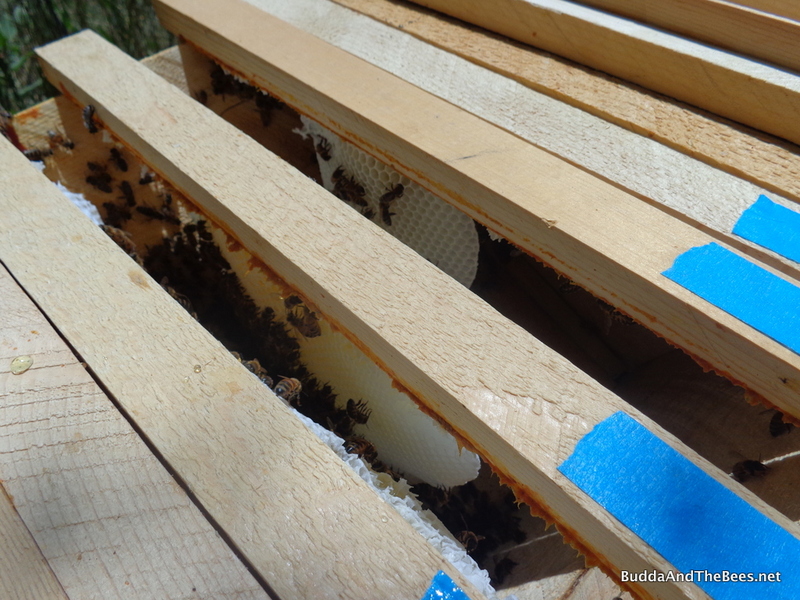 I do have a 1″ ventilation hole at the back of the hive for cross ventilation in most of my TBH’s, but in general, the hives are pretty well sealed up (no gaps between bars and everything sealed with propolis. I think the very dry heat here helps them cure faster. Even though I’m partial to TBH (since that’s what I started with), having a different type of hive is definitely a learning experience. In your climate, you might want to consider the insulated TBH hives like Julie has built. Regarding cross comb in your top bar hives….have you ever tried a top bar design like Christy Hemenway shows in her book? 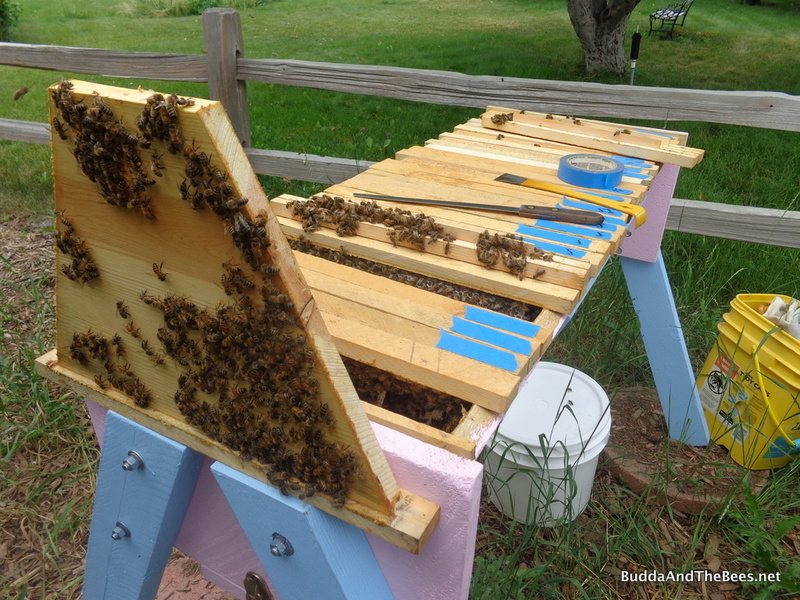 The top bar is designed so there is a pronounced bevel….seems to help the bees build straight comb. It’s only my first season but with 2 hives and over 30 bars of drawn comb (total) there isn’t any cross comb. The caveat is the top bars are more difficult to make. I have not tried the beveled bars just because I’m lazy. As you point out, they are more difficult to make, but Julie D. has a great tutorial on how to make them. (http://happyhourtopbar.blogspot.com/2015/06/making-solid-one-piece-wedged-bars.html). Since I can easily crank out bars with a kerf like I use now, I’ve just never taken the time to make the wedged bars. Plus, I’m usually making hives and bars at the last minute – like the week before my bees arrive! I need to plan better. There are two problems I had with my latest set of bars that could be contributing to the problem. First, I made them a bit narrower than they should be. 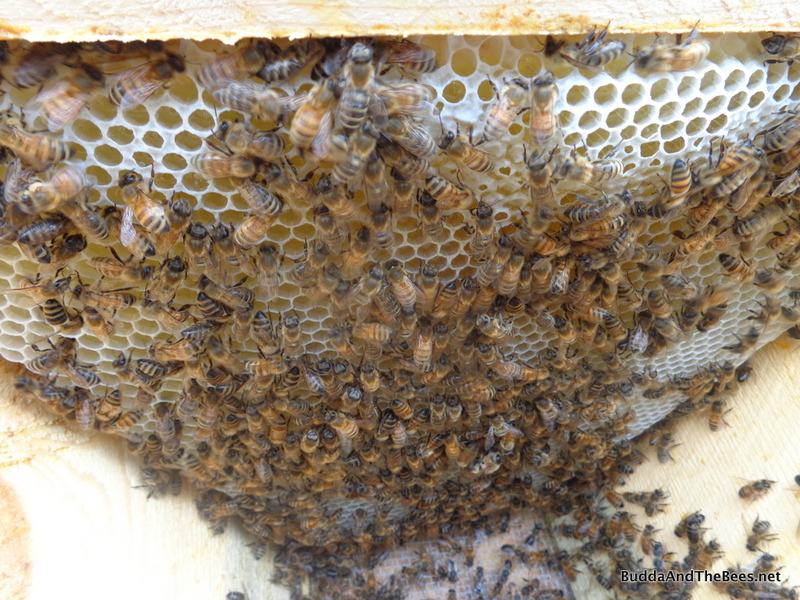 When I first started, I used 1 3/8″ wide bars for brood and 1 1/2″ for honey. I found they never built on the 1 1/2″ bars and saw others post about using 1 1/4″ bars with spacers when needed. On this last set, I was a little off in my measurements, so they are slightly narrower than 1 1/4″. But, I figure adding spacers as needed would help. The second problem is that I probably made the kerfs to high. I’m finding that they are building on just one side of the kerf more often rather than spanning over it. So, lower kerfs would probably help. I’ve seen cross combing on wedged bars as well, so while that’s not the total cure-all, I’m sure it helps a lot.